Dr Marc's Blog: X Men Musicians? 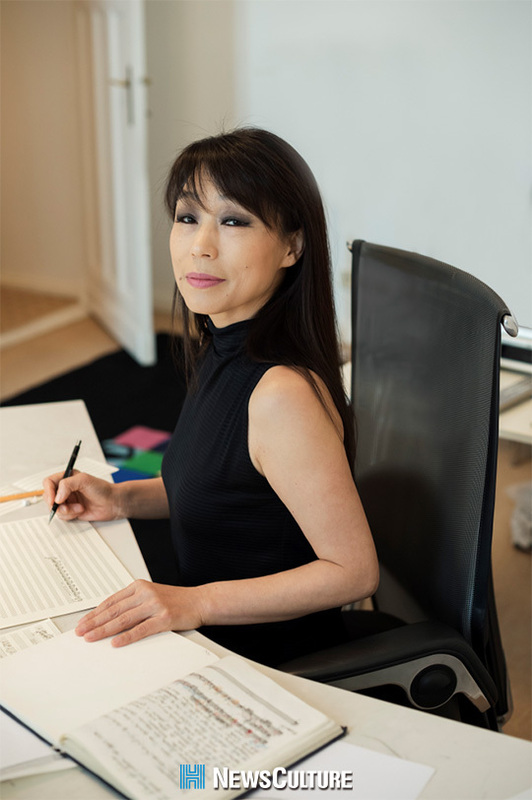 The Malaysian composer Adeline Wong gav﻿﻿e a talk recently introducing a piano piece on which she was working and explaining how the work of two other women composers (Louise Talma and Unsuk Chin) had been a specific influence. 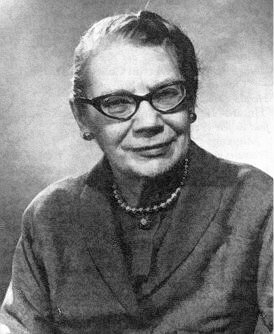 She had called the talk “Women Portraits”, so clearly the issue of gender was a significant focus. In the light of that, in the ensuing question and answer session, I asked (part mischievously, I must admit, but primarily out of genuine interest) whether she had been influenced by Talma and Chin because of gender or because of some significant musical element. The answer was that gender had driven this, and that musically there was nothing in either composer’s work which could in any way be described as specifically feminine. The issue of gender has become a major point of debate in British society. Even as I write this, the UK government is demanding all companies publish pay differentials between male and female employees, the BBC is undertaking a fundamental review into the acknowledged bias it shows in favour of men over women, and Easy Jet budget airline is actively recruiting female pilots to counter the dominance of men in that profession. Catching an appalling late-night comedy show on the radio last night, a foul-mouthed and utterly repugnant female comedian (we no longer use the word comedienne as it is perceived to imply gender stereotypes) drew cheap laughs from her audience by focusing on male genitalia and male sexual acts in a manner she probably believed to be indicative of the new liberation women feel in being able to compete with men on a level playing-field (sadly by descending to their level rather than rising above it). And a British female politician was sounding out just yesterday against a popular current affairs panel game as being a bastion of male attitudes into which females are admitted only to be ridiculed and demeaned. More relevantly, I caught a news item this morning in which a female “podcaster” (I did not know that was a profession) had invited women to write in with their parodies of men writing about women. Among some men there is a perceived reticence to read books by women authors, claiming that they can identify from the prose style the gender of the author, and prefer the style adopted by men. (I have a horrible confession. I am one of those who resist, largely, the writings of women on these very specious grounds. I excuse myself, however, on the basis that while men probably write no better – and often a lot worse – than women, I rather like the escapism of a novel which deals in the kinds of shallow stereotypes and macho machinations which seems the preserve of the male author.) I have even been into a bookshop in which the books were ranged, not by genre or alphabet, but by gender. (On reflection, remembering the book I bought there, it may have been a gay bookshop. It was round the back of Foyles in Soho, and there was a curtain over the door. But I was young and innocent then, and could not tell a homosexual from a homeopath and was unaware of the existence of both.) As this “podcaster” read out the parodies sent by women pretending to be men writing about women, I was struck by an awful sense of déjà-vu; these did not sound like parodies at all, but like the kind of things I read in the cheap novels (always by men) I buy at airports. If we can identify (or believe we can identify) the gender of an author, surely it should be possible to identify the gender of a composer? But it seems not. Perhaps that’s because we still don’t get the exposure to music by women that we get in the literary world, but I would suggest that the reason is very different. I would argue that the issue of gender in composers has no great historical legacy, unlike in the fields of employment and literature, and any gender distinguishing characteristics have long been subsumed within a gender-neutral language. 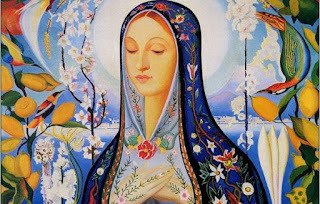 The first recognised major composer was a woman (Hildegard of Bingen 1098-1179) and we see women as having initially played a very significant, not to say dominant, role in music until the Roman Catholic church started seriously to undermine the value of women in music sometime in the 15th century, and right up until the 19th century women outside the church had an important place in music until a group of male German philosophers decided they would define great music, and excluded not only most non-Germans but all women from their categorisations. Even then, the likes of Fanny Mendelssohn and Clara Schumann kept the feminist candle burning in opposition to all this Teutonic Testosterone, while over in France – dismissed as a musical force by the 19th century Germans – women never lost their place on the high - if not the actual top - table of composers. Some time back, my good friend Peter Almond drew my attention to a composer whose music he had recently discovered and was in near-ecstasy over. He sent me some discs and I, too, felt that this was a composer of merit whose obscurity was utterly unjustified. 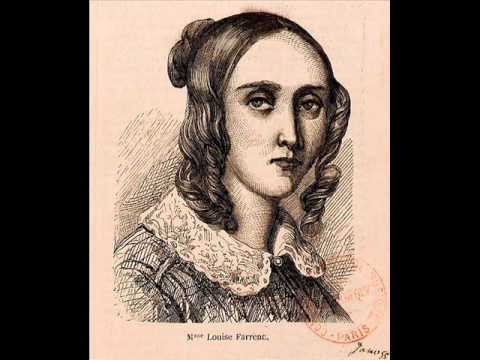 That she was a woman (Louise Farrenc) never really crossed my mind – it was just lovely music. 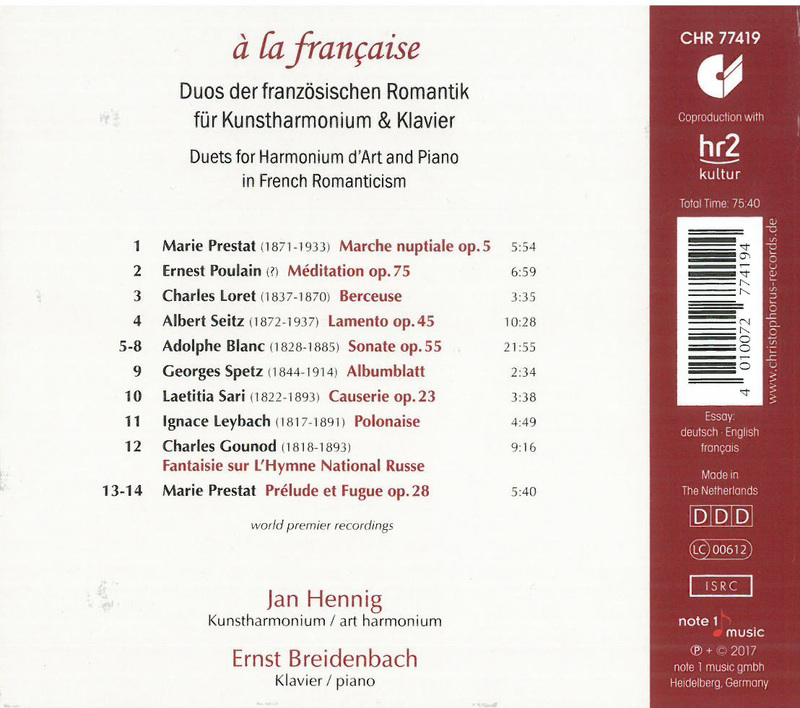 Similarly, I am in the middle of reviewing a newly-released disc of music for Harmonium d’Art and piano which features music by a couple of composers who are women. 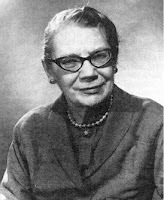 You only know this when you read their names or look into the booklets – nothing is done to promote them as specifically female composers, not least because there seems no need. In music we generally go by quality not gender. That said, I can understand the obscurity into which Marie Prestat (1871-1933) and Laetitia Sari (1822-1893) have fallen; and it has nothing to do with the fact that they are women. The former, one of Franck’s favourite pupils and the first female student to win five times the Paris Conservatoire’s prize for counterpoint and fugue, is represented by two works neither of which has any musical interest whatsoever. 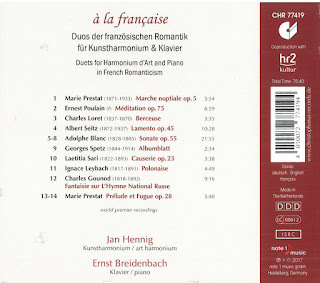 The latter (rather patronisingly described in the booklet as “spouse of the French composer Jean Henri Ravina" – of whom I have never heard) also shows a complete lack of musical imagination, although like Prestat, was clearly technically competent. But the fact is, women have been writing music for as long as anyone has. They have assimilated the language – or perhaps men have assimilated the language – which transcends issues of gender. As male and female, there is nothing to be said in music; as human beings there is plenty. I do not deny that throughout the 20th century and for centuries before that, in many cultures women were unfairly treated and their labours as creative artists dismissed by men, and we would do well to be conscious of that to prevent it happening again. But we should not adopt different yardsticks in assessing the quality of work because of gender. A musical composition should succeed or fail on its own merits, not on the gender of the composer. As a footnote, a student has come to me with a proposal for a research project and I am very strongly supportive of it for I believe it addresses an issue of gender and music which has long been ignored or, perhaps, not even considered. My student was intrigued as to why so many men involved in the arts – including musicians in all genres – display and even eagerly promote feminine characteristics. They dress in a gender-ambiguous manner, they talk openly about their homosexuality, at the height of the AIDS crisis they seemed to be more affected by it than other sectors of society, while the mincing, effeminate male is seen by many as a parody of an artist. This led the student to the thought that, possibly, men attracted to music (and the arts) possessed a higher proportion of the X chromosome than those who lacked musical sensitives. We need to think about this, and strip away all the hearsay and assumption (and, possibly, prejudice). But there may be something in it. It might turn out that all composers are, scientifically, more female than male; which is why there is no clear gender distinction in musical compositions.